Great book with extensive instructions and lots of pictures. There is a blogging community that is making every recipe and writing about them, so if you want to read reviews of a recipe you can google Tuesdays With Dorie or TWD and the name of the recipe and you'll get tons of hits. If you're going to own one baking book, consider this one. A must-have book for any baker. Delicious light, cakey muffins. I used fresh blueberries. I love the way the orange flavor enhances the blueberry flavor and makes these different from the usual blueberry muffin. Made with white whole wheat flour. I really liked the orange flavor with the blueberry -- a nice change from plain blueberry muffins. Moist & delicious -- would make again. I used white whole wheat flour, as usual, and maybe 1 1/4 cups blueberries. I think more blueberries would have been even better. I loved the orange and blueberry flavor combination. My oven may be running hot, but I neglected to check the muffins until 22 minutes and they were already a couple of minutes overdone, so they ended up a bit dry, but still good. 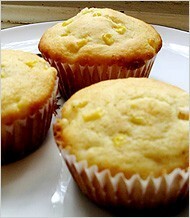 Good corny corn muffins - light and not too sweet. I used white whole wheat flour and reduced the sugar to 4 Tbsp, as I didn't want them to be sweet, and they weren't. I added rosemary, which went well with the corn. Overall, they were very pleasant, good with butter. I might try adding some parmesan or feta cheese next time for a bit more flavor. I used white whole wheat flour and probably just 1 Tbsp lemon juice (from 1/2 lemon I had left over). My oven may be running hot, but they were perfectly done in 18 minutes. The flavor was very pleasant, mildly sweet and orangey. The texture was medium grained and slightly crumbly. We enjoyed them very much. I like that there isn't so much sugar. I reduced the butter to 1/3 cup and they turned out fine. For the fruit I used prunes and dried apples. The muffins were delicious, not too sweet, with a fairly hearty texture. I made these with dried cherries and pecans. They were okay. I liked the fact that they weren't too sweet and we liked the texture from the cornbread and oats but I prefer muffins with more spice/flavor and these are pretty plain. Simple and delicious. These muffins have a bit of tooth but are favorful and moist. I used quinoa flakes instead of oats and an equal mix of dried cherries and walnuts. I will make these again. I was disappointed in this recipe. The muffin was not lemony enough. The proportions for the glaze (2-3 tablespoons of lemon juice to 1 cup of confectioners sugar) will give you a runny glaze that melts into the muffin. If you want a glaze that will resemble the beautiful photograph in the book, start with 1 tablespoon of lemon juice and then test your glaze. My muffins ended up looking beautiful after tinkering with the glaze, but they looked better than they tasted, which is always a bummer. I like my lemon baked goods really lemony so based on mamacrumbcake's comment I added 1/4 teaspoon lemon oil along with the vanilla to the batter. I also used just 2 tablespoons of lemon juice in the glaze and it was just right. With the extra bit of lemon oil the flavor was really bright. These are not a super sweet cake-like muffin but rather an old-fashioned coarser crumbed breakfast muffin. They were perfectly baked at 18 minutes. This is a great recipe to play around with - I've used this batter and marbled it with jam, the muffins were really good! One of my favorite muffin recipes. Rubbing the sugar with the lemon zest makes for an exceptional lemony taste, while the poppy seeds add a nice crunch. These were very tasty. I used Greek yogurt in place of the sour cream and so they were quite tangy, but in a great way. I also sprinkled sugar over the tops of the muffins before baking instead of using the glaze. I'll freeze the rest for breakfasts this week. These are pretty good pumpkin muffins. They aren't particularly sweet. There's a good amount of pumpkin flavor and the pumpkin spice complements it, instead of overpowering it. The raisins and walnuts are nice additions. I omitted the sunflower seeds as I didn't have any. This recipe lends itself well to changes: reducing the sugar by 1/3, using oil instead of butter (and reducing that quantity as well) and replacing ½ the flour with whole wheat flour still results in a deliciously spicy, moist muffin. We loved these muffins. They are tasty and not too sweet and had a lovely, light texture with a very high dome. I especially liked the seeds on top. Dorie's carrot muffins are still my favorite but these are a great alternative. Dorie says this is Sarabeth's recipe, although I haven't compared them. They do remind me of the ones I ate at that restaurant. I used white whole wheat flour, but otherwise followed the recipe. I didn't have sunflower seeds, so I topped them with pumpkin seeds. These are very good, but I think Flour Bakery's are still my favorite, as the pumpkin flavor is much stronger (there's a lot more pumpkin in them). These weren't as light and fluffy as I was hoping they would be. Flavor was nice, but texture was off. Perhaps over-baked? These are fantastic- some of the best muffins I've ever had. They aren't too sweet, the spice mixture is perfect and the texture is lovely. (FWIW, I don't like carrot cake and I still loved these). Great recipe. Not too sweet. Light texture. The coconut taste gets stronger with time and is a good addition. Moreish. Will definitely make it again. Really good recipe that we have made once exactly as written. Changes we would make for next time: use 1/2 ww flour, more cinnamon, nutmeg, use coconut oil, muscovado sugar instead of white. These are delicious cinnamon-scented muffins with a flavour reminiscent of cappuccino and a soft, cake-like texture. I've made them several times now using half whole wheat flour with great success. These are my very favorite muffins. I keep a batch of these in the freezer at all times! Made these on 6/20/13 and found them very disappointing. Would agree they are better at room temperature, but still somewhat bland. I also found them a little doughy. Next time will try a recipe that has a dairy component, other than butter. I was surprised to find these are the only coffee muffins I have in my EYB collection. It's been a while since I made these, but I remember they were very moist and delicious. More like a dessert/afternoon treat than breakfast, which is when I usually would eat a muffin. At the time, I marked them as a favorite, but haven't made them again which I really should do one of these days! Like a muffin, they're made by mixing dry with wet ingredients, are lower in fat than cupcakes and not overly sweet. Also like a muffin, they dry out easily. For me, they're too chocolatey to be breakfast but not chocolatey enough for a dessert. p. 19 -- Made these a few years back. My notes from the time say "not great, should be much more chocolatey." However the recipe still sounds great so I may have to try again! Best biscuits I ever made. Since the method and ingredients are pretty basic, I have to credit the butter. I always used Crisco in the past. These rose nicely, were flaky, and had a wonderful flavor! As someone who grew up making biscuits out of a can, this had a helpful tutorial on how to make them properly. I like to freeze part of the batch per the sidebar. Perfect flavor and simple technique. Next time I'd like a bit more rise...maybe a pinch more baking powder? These were very light biscuits and very tasty. Perfect served warm from the oven with some butter or jam (or both). I started checking them at 10 minutes and they were done at 12. I was not happy with the texture of these biscuits. They came out very dry, more like cookies than biscuits. These were pretty good but not particularly memorable or special. If I made them again, I would sprinkle them with sugar to add some crunch and sweetness. Reminiscent of nutmeg-laced old fashioned cake doughnuts, these were tender with a slight chew from the oatmeal. Delicious and not too sweet. I prepped them the night before and froze them. They baked perfectly in 20 minutes. I used dry toasted pecan pieces instead of walnuts because I thought the flavor would complement the honey. It did, except the honey wasn't actually noticeable in the baked scones (they were barely sweet), so we drizzled honey on top. This is an easy to throw together, rustic apple cake. Nothing mind-blowing here, just an honest cake to have with a cup of tea. Very orangey, overpowers cardamom. Next time I'd omit or reduce zest in favor of spice flavor. I used white whole wheat flour, but otherwise followed the recipe. The only quibble I had was with the instructions, which call for mixing dry ingredients in one bowl, then dumping them into another bowl, mixing the sugar and zest, then adding the other dry ingredients back. I simply started with the sugar and zest, then added the remaining dry ingredients. It worked fine. The cake turned out well. I was surprised that the cardamom flavor wasn't stronger, although I did use preground cardamom. I also may have used less orange zest (zest of 1 orange in topping, 2 in cake). But Dorie does say that the flavor blends with the coffee and orange, which I found to be the case. My family really enjoyed this cake for breakfast, and thought it wasn't overly sweet. It was fairly easy to make and quite good. However, if I make it again I’d up the cardamom, because, as Dorie notes, it’s mysteriously unidentifiable in this recipe, and I’m a huge fan of cardamom forward baked goods. This is one of my favourite cake recipes for a fruit-topped coffee cake for a number of reasons: it’s made with brown sugar so has a lovely caramel flavour that complements all fruits; the batter is thick enough to support the fruit on the top; it’s made with oil and butter so the cake is soft and moist even straight from the fridge. I made this with purple Satsuma plums from my tree, and it was both easy to put together and delicious. I added some ground cardamom to the batter, and the warm brown sugar flavor combined with the cardamom worked wonderfully with the plums. I didn't have good luck with this cake- mine came out bone-dry after a 35 minute bake. I did forget to remove from the pan after 15 minutes to cool outside of it, but otherwise followed the recipe as directed. This will not be a repeat. Wow, this is one of the best things I've ever eaten! Sweet plum sauce, juicy pieces of plum, pudding-like cake with chewy buttery edges. Super easy as well. Homey, but so delicious I'd serve it to anyone I'd want to impress. This was very disappointing. It wasn't awful but it wasn't particularly good or interesting. It did not rise very much - not sure if I did something wrong - otherwise it seemed fine. I made it the night before and it was still very moist the next day. I used dried apples, probably a bit more than the 1/2 cup called for. The bread was sweeter than expected, so I might reduce the sugar next time or maybe skip the topping, although the topping adds a nice touch. This recipe is definitely a keeper. Chock full of juicy mango and flavoured with ginger and lime, this loaf offers the taste of the tropics. There's too much batter for my loaf pan so I usually make 1.5 times the recipe and bake two 8 1/2" x 4 1/2" loaves. It's delicious freshly baked but equally good the next day as the loaf stays moist and the flavours mellow over time. We thought this was decent but like many of the recipes in this book, I found it to be sweet but lacking in complexity. I must be the only person who doesn't love this book but so far I'm not wowed by the flavors in anything I've baked from it. The cocoa flavor really stands out; the banana is subtle. Despite the amount of sugar, the bread was not overly sweet. I almost omitted the chocolate chips, but added them at my son's insistence, and am glad I did. White whole wheat flour worked OK here, although it was somewhat noticeable (more the first day than the second). The bread was not as moist as regular banana bread, but was not overly dry. We enjoyed it. This was good to use some old bananas however the chocolate flavour is much stronger than banana. Took approximately 20 minutes longer to bake than the revipe suggested. I substituted a milk / yoghurt mixture for the buttermilk. This was delicious and moist but the banana flavor did not really come though - it tasted mostly of chocolate. Tasted the batter before baking and the banana flavor was prominent so the lack of banana flavor after baking was a bit disappointing. The banana flavor was pronounced in my cake but I used very ripe (probably overripe) bananas. My issue was that the combination of flavors just wasn't particularly good. The cake also seemed a bit dry. I've made this before without any of the optional ingredients and it was good. This time, I included all the optional ingredients, and I like it a lot, the orange zest and cocoa really differentiate it from other cinnamon raisin breads. The top layer of the swirl, the bread did not rise as much as as the inner layers, I saw from the photo that Dorie's loaf had the same issue. Instead of plumping the raisin by steaming them, I soaked them in Sherry per James Beard and rather than using my hand to spread the butter on the rolled out dough as suggested by DG, an offset spatula worked real well. I used half white, half white whole wheat flour, and used instant yeast, so I skipped the proofing step. I refrigerated the dough overnight before shaping and baking, which worked great. I added all the optional ingredients: orange zest, nutmeg, and cocoa. None of them stood out, but they all added subtle flavors to complement the overall cinnamon taste. The dough was easy to work with and rose beautifully. My only problem was baking time - after 45 minutes, it did not seem quite done (too heavy) so I took the temperature and it was only 105 degrees in the middle. I ended up baking it (still tented with foil) for another 20 minutes before I decided it just *had* to be done. And, thankfully, it was perfect. We loved it toasted with butter. A solid cinnamon swirl bread. Slight issues: I ended up needing more butter than listed for spreading on the dough before sprinkling with the raisins and sugar and I agree with Anya_sf that it needs more time in the oven than stated in the recipe. Mine was a little under cooked and I should have checked the temperature before taking it out. It tastes great toasted with butter, especially the remainder of the loaf that I sliced and squirreled away in the freezer. I was looking for something easy to halve and wanted to try something new other than my "go to" Silver Palate stand by (otherwise why have all the books??) So many Dorie choices but this one WAS easy to halve . They are as expected ......crispy edges, chewy centers and a nice "caramalizey" taste. I added the finely chopped pecans which I don't normally do . They are GOOD. Mine ended up pretty thin, but with a nice chew and you can taste the brown sugar in them. Very buttery. I would up the amount of walnuts just because I would have liked more nuts. p. 68 -- Best choc. chip cookie recipe I've tried so far. Chewy and almost caramel-y, with crisp edges. I omit the nuts as I dislike them in cookies. These were good. They were chewy and taste like you expect a chocolate chip cookie to taste. I used pecans. I got 48 cookies out of the recipe. For the last tray, I added some coconut to the dough per her variation. These were decidely okay chocolate chip cookies. They end up very thin. Fairly thin but still got a nice and chewy result. I toasted the walnuts before mixing them in which improved the flavour. I used about 3/4 as much chocolate as listed (chopped block of dark chocolate) but there was still enough to go around. I baked some and froze the rest of the batch. This is my go-to chocolate chip cookie recipe. This has become the family favorite - and when I don't make them one of the teenage boys do. Though they love the dough so much we don't get so many cooked. If the dough is put in the fridge before cooked it doesn't spread so much - but either way they are delicious. Don't overcook or you end up with a much crispier cookie - we prefer them a bit soft and chewy. gotta agree with this- this is my best cc cookie recipe. Always raves. http://www.solidteknics.com/fonte-cast-iron-recipes/cast-iron-cookie-monster Want tol try this skillet version! As Dorie says "These are three really great cookies rolled into one". So if you cannot decide between oatmeal & raisin, peanut butter or chocolate chip, make these. May be my new favorite cookies.How can you go wrong with peanut butter, oatmeal and chocolate chips all together in one cookie! These are amazing cookies, all my favorites rolled into one. They're nice and chewy and turned out just fine without refrigerating the dough. A really nice cookie. The oatmeal, peanut butter, and chocolate are all well balanced. I would've liked a bit more salt in the cookie. The texture (particularly the next day) is a lot harder than I'd like in a cookie. I followed the recipe exactly, although my cookies were slightly larger, so I only got 21 (half recipe). I made the dough a day ahead. Next time I would omit the nutmeg and maybe use less cinnamon, as I felt the spices overpowered the peanut butter and chocolate flavors. I'll definitely make these cookies again - loved the combination of oatmeal, peanut butter, and chocolate. used nutmeg instead of cinnamon. extra chocolately, as she says in the book! One of my favorites for the holiday season -- I've made these many times. Make sure to use a healthy amount of freshly cracked black pepper -- I usually do at least 15 twists of my pepper mill. The other spices could stand to be amped up a notch too, and I think that every time I make them, but have yet to try adjusting the quantities. Instead of dividing the dough into two disks before chilling and then further dividing that into pieces, I just chill the whole bowl of dough and then use a 1Tbsp (i think?) scoop to portion it, then roll each ball in the sugar. It yields the same result but with less steps. Also, baking according to the recipe makes a nice, crispy cookie, but I actually prefer to underbake them slightly (I usually go for just 10 mins), which makes them soft and chewy. Makes a large, flat crisp cookie with a little aftertaste of heat. Very quick and easy recipe, fun to make with my four year old daughter. I used homemade blueberry jam and almond extract instead of vanilla, and left out the ginger. Really nice combination. I thought I was making them small, but it made half what Dorie said it did, so I guess next time I have to make them even smaller. Great cookies if you love Maltesers (or Whoppers in the USA). Produce a cakey cookie with delicious malty taste, chocolate chips and some crunch from chopped Maltesers/Whoppers. p. 85 -- These were good, but kind of involved and not that special. These are very good fudgy brownies. They have a nice shiny crust on the top and are soft in the middle. They're made with bittersweet and unsweetened chocolate for a rich chocolate taste. A mere 1/2 tsp. of espresso powder gives them a nice mocha flavor. Why they're not perfect: 1. I'll have to try them without the espresso powder to see how the chocolate flavor fares on it's own. 2. They're quite thin - thinner than I'd really like. I wonder how the recipe would double. They're quite easy to make - the entire recipe can be made in one bowl if you use the microwave to melt butter and chocolate as I do. I would make these again. These are standard fudgy brownies. They have a good chocolate flavor without being too sweet but I felt that there was something missing from them. These are quite delicious - slightly crisp outside and fudgy inside. Thin brownies, rather than thick ones. Fudgey. Have also baked these in 2 small 6" heart-shaped pans for Valentines. These were good though not great - not enough chocolate according to my 14-year old daughter. I did add the chocolate ganache icing but it wasnt enough to lift them into the super brownie category (which results in repeated baking). Meh. Just OK. I do not like cakey brownies generally, I prefer them to have crispy edges and be soft in the center. These were definitely cakey, and the honey and chocolate flavors are about evenly balanced. Fine, but will not make these again as they're not worth the calories! The brownies were good, but I don't know why you save some of the chocolate batter to swirl with the cheesecake batter since it has a sour cream topping that hides the pretty swirling. I think I will just skip the swirl next time I make them. These are quick, easy to throw together, without too many ingredients. Once I had divided among 16 muffin cups I found the finish buttons to be a little too thin-- mine didn't get a nice subtle dome on top like the picture showed. But a nice tiny hint of crunch on the outside and dense chocolate-y inside. I made 1/2 recipe in an 8"x8" pan. I didn't have butterscotch chips, so I used white chocolate chips and used dark brown sugar instead of light to add more caramel notes. I underbaked them a bit, which in retrospect wasn't necessary - she says to take them out when a knife comes clean, but most brownie/blondie recipes say not completely clean ("a few moist crumbs"). They sunk in the center and were very gooey, so could've been baked a tad longer, but no one complained. They were everything a blondie should be - sweet, butterscotchy, with tons of add-ins. These chewy cookie bars were quick to throw together and super delicious. I used butterscotch chips and chocolate chips with walnuts as recommended. Although it feeds a crowd, these disappeared in no time. A keeper recipe! Chewy, sweet bar cookie - I used butterscotch chips, unsweetened coconut and toasted pecans - it reminds me of a Hello Dolly Bar minus the graham crust. Center was moist and appeared underdone but firms up as it cools. I like them chilled so I store them in the fridge. Like oatmeal chocolate chip cookies, only better, with chewy crust and topping and a perpetually gooey chocolate filling. I used whole wheat flour (unnoticeable), reduced the sugar by 1/2 cup and omitted the peanuts. Perfect fall cookie! The best apple bar cookie I've ever had. Quite sweet. Liked them better refrigerated. These are very good and intensely coffee flavored. My husband's very favorite. Once I subbed bashed-to-crumbs homemade toffee for the mini choc chips and the flavor was delicious, but any larger toffee pieces went melty and they didn't keep their shape as well. These cookies are rich but they last forever (like a month!) in an airtight container. These taste like mediocre shortbread cookies. Neither the brown sugar nor the pecan flavor can be tasted in the finished cookie. p. 127 -- These totally didn't work for me, not sure what I did wrong. But they completely melted/disintegrated in the oven despite my dough being well-chilled. Womp womp. Best shortbread cookie ever. Following the procedure is key to the correct texture. Even better a day or two later. p. 134 -- These are good, but very involved for a cookie recipe. These are as delicious as everyone else says they are. Yes, the dough is rather crumbly, but don't let it stress you out too much -- just press the rounds back into shape on the cookie sheet and they will bake up just fine. WORLD PEACE COOKIES from Food 52 site using grams. I made these to bring for Valentines Day dinner, they were fantastic, not difficult to work with at all. I didn't have 3 hours to chill them so put them in the freezer with a bag of ice over them for one hour and 10 minutes. Used Maldon salt in the cookie and cooked them exactly 12 minutes. Well these are as good as advertised! I used fleur de sel and a Lindt 70% chocolate slab. I refrigerated the roll overnight and my only slicing issue was from the larger chunks of chopped chocolate - not the dough itself. I did chicken out at the 12 minute mark even though she clearly says that they will not look done! 1 extra minute still resulted in a lovely sandy texture with intermittent snaps of chocolate. Just delicious. These are very delicious, but crumbly and can be frustrating to work with. Well worth the effort. So yummy and chocolatey. Sprinkle each with a couple of Maldon salt crystals. A delicious salted chocolate shortbread cookie - more please! Occasionally I make a recipe that I find just okay, but others rave about. Were these really wildly popular over the holidays, or did one guy just gobble them? Due to reports of difficulty with this dough, I closely followed the tips on sablés in the book (a few pages preceding recipe) & had no trouble. Her hints: avoid over-soft oily butter, don’t whip air into it, mix in flour minimally, & chill well. Others advised careful measurement, so I used grams from Food52.com rendition. Guess I will make them again. Loved these. I added orange zest because I had oranges. I added a bit of lemon zest. These made a very nice rolled cookie. My favorite sugar cookies for rolling-out so far. While the kids had fun using their cookie cutters and decorating the cookies, the adults just devoured them plain. Will make again! Who knew these amazing pastries could be so easy? Prefer them with more nuts in place of the chocolate bits. SO GOOD. These are chock full of all kinds of stuff -- jam, chocolate, AND nuts -- unlike most rugelach i've had that are just plain fruit jam or chocolate. These are way, way better than any store-bought varieties I've had, and really not that difficult to make (though the rolling can be a little messy with so much filling). One of my favorite cookie recipes of all time. I had similar issues - the earl grey flavour was not very pronounced. It also wasn't much fun trying to strain the tea leaves from the butter after steeping. Overall these had a nice taste but not quite what I was aiming for. What a waste of my earl grey tea. I even steeped the leaves in the butter longer than specified and I still could not detect the bergamot. I could taste the honey though. Next time, I'll just stay with the regular madeleines. I thought this cake was delicious and it was a hit with people at work. Nice and moist. I substituted roughly chopped almonds for the ground nuts and used sultanas instead of prunes. The almond extract flavour was certainly strong - keep an eye on this one! I used ground almonds and the optional almond extract, pears, and prunes. My bundt pan is dark and I thought the cake might be browning too much, so turned the oven down to 325 for the last 10 minutes. The cake was nice and moist. Flavor was definitely better the next day. I loved the pears and prunes together, but not everyone liked the prunes, so I'd try raisins next time. I have made this before and will definitely make it again. This was the first bundt cake I’ve ever made. It got a little dark on the edges but tasted quite good. Lovely marbling and the cake tasted great. Next time I would toast the walnuts to bring out their flavour. I served this with a fudge glaze (cold at work). Love the idea of serving with warm fudge sauce and candied walnuts as per book suggestions though. I used nonfat Greek yogurt instead of sour cream, because that's what I had on hand, and it worked great. For the swirl, I used walnuts, semisweet chocolate chips that I chopped a bit, and raisins. I also had trouble layering the swirl using the directions; the batter did not want to cover the swirl. Next time I would just layer the usual way (1/3 batter, 1/2 swirl, 1/3 batter, 1/2 swirl, 1/3 batter). I might also use a smaller bundt pan, as this cake doesn't require the large size pan. I loved this cake! When sampled the day of baking, it had a bright orange flavor which complemented the cinnamony filling. A couple of days later, the orange had mellowed, but the cake was still great. The swirl was crunchy - almost candied - in places, and all the swirl flavors melded together. Made this as a simple sour cream Bundt cake. Turned out great. To be served with ice cream. A very nice bundt cake. What I would differently next time. Put 1/3 batter in pan, spread 1/2 strudel, 1/3 of batter, rest of strudel and then rest of batter. According to instructions I had hard time covering strudel. The apple flavor really shines through with this cake and gets even better the next day. But as with as other fresh apple cakes the yummy crunchy exterior quickly softens so if you like the crunch serve it the same day or even better, while still warm. I used a golden colored nonstick Nordic Ware bundt pan sprayed with Bakers Joy, an oil spray with flour, and had no problem with the cake sticking to the pan. I baked it the full 55 minutes after checking for doneness at 50 minutes and it was perfect. I used toasted chopped walnuts, grated Granny Smith apples and a jar of apple caramel butter. This is a very dense cake because of the apples. I used homemade apple butter (couldn't find it in stores), toasted pecans, Fuji apples, and white whole wheat flour to make it a teeny bit healthier, since we had it for breakfast. The cake was beautifully moist served the day after baking. It baked fine in a dark Bundt pan for 55 minutes (pan coated with Baker's Joy) and did not stick. Everyone at work loved it! Made this for Thanksgiving and used Brown Sugar Glaze from an apple spice cake recipe in Bon Appetit Feb 2007 issue. Cake was delicious, very moist and great apple flavor. Used spiced apple butter. Baked for 50 min and probably should have left in about 5 min longer. Did not reduce oven temp although used a dark nonstick bundt pan. Buttered the pan as recipe instructed, however the cake stuck pretty badly at the bottom of the pan so had to remove some of it in chunks, piece back together and "disguise" it with the glaze. Next time will use PAM for Baking or Wilton cake release. This was a great cake as written but I had to change it after the first time. I used fresh cranberries, and made maple sugar drizzle. Lowered the sugar. I used half regular, half white whole wheat flour and no one could tell. I probably added over a cup of cranberries and maybe 3/4 cup pecans - the quantities of mix-ins are pretty flexible. I love the combination of pumpkin and fresh cranberry and would even add more cranberry next time. I couldn't resist the maple glaze and augmented the flavor with maple extract. My cake was done after only 55 minutes, but my oven may run a little hot and I used a dark colored bundt pan. This is one of my favorite cakes! This was fine, but given the multitudes of other wonderful holiday desserts out there this wasn't that special. Yummy cake, moist with pops of cranberry & nuts. Next time, I will definitely butter AND flour the bundt pan, because the top 1/4 of my cake remained in the pan after turning the cake out. Fortunately, it was relatively easy to do a patch job & hide it with the maple icing! Even with patching, the cake has eye appeal & looks very festive. Walnuts were used in place of pecans. I'm adding a PS to this note: made this again a few weeks later--buttering & flouring pan did the trick, HOWEVER, the cake was probably too moist both times it was made, as the maple icing just sort of sank into the cake. I'm wondering if using frozen cranberries made the batter too wet? They were still frozen the 1st time & thawed the 2nd. Oh well, still tasted good! This was moist and light- lighter than banana bread certainly. I agree with the other reviewer and would reduce the sugar-it was sweeter than I would like. Which is exactly why my kids loved it! This is my go-to banana cake. It has great banana flavour and a soft crumb and is particularly good with added toasted walnuts or chocolate chips. I usually reduce the sugar by a 1/2 cup/100g. Note that plain yogurt can be used in place of sour cream. Delicious, light texture, super moist, and nice banana-y flavor. A hit! Lovely flavour, make sure the cake is nicely browned for extra taste and texture. I used a 12C bundt pan yet still had a little too much extra batter. I didn't serve with the suggested lemon icing but might try next time. I used unsweetened coconut and didn't toast it, also used the suggested rum. This is a great cake, full of flavour and had lots of fans. I made a simple icing using the last of the coconut milk, butter and icing sugar and drizzled over the top, dusting with coconut. Very sweet to my taste. Quick, easy and coconuty, whole family liked it. As per Zorra's recommendation reduced sugar by 1/4, still sweet enough. This is one of my favorite cakes when I want to make a cake that's not a lot of fuss. I've done the lemon variation several times, and it is equally delicious. Start checking for doneness around the 40 minute mark. I adore this recipe. The cake is light but full of flavor. I leave out the coconut flakes because I don't like them and this is still a delicious cake, the coconut milk gives it a nice hint of coconut without overpowering the lemon. I topped mine with a dollop of lemon buttercream but I think in the future fresh whipped cream would be even better, with some fresh fruit. Very good, but next time I'd reduce the sugar to 3/4 cup. A very good simple cake. Good cake but too sweet. Light texture. Managed to get the crunchy exterior with standard cake tin. I will definitely use less sugar next time. Very nice little cake. I reduced the sugar to 3/4 cup (150g) as per zorra's recommendation and used princess flavouring in place of the vanilla, almond extract and lemon rind. I kept to the traditional "prunes only" version of the far and used Armagnac. Was rather alarmed at seeing the melted butter surfacing on top of the cake as it was cooking and remaining as I took it out of the oven, so did remove what I could with kitchen paper. All in all it is a really tasty recipe which I'll bake again, although using less butter. This is fool-proof with any of the variations! The cake was nice but the peaches didn't really add much to it. My peaches also stuck to the bottom of the pan so I lost the nice design I had made. Sweet, tender, buttery cookie filled with tart ruby fruit...this is a visual as well as a taste sensation. I often make it with leftover homemade cranberry sauce. I didn't particularly care for these. The cinnamon flavor is too strong. The cake is rather dry. The icing is took thick and takes on an unpleasant texture. I hope the squirrels like this cake more than my family. I've had this simple cake bookmarked for years. I was looking for something simple to bake today and had everything necessary for this small cake. This is basically a glorified coffee cake. Half the batter is added to the pan, a sprinkling of chopped chocolate and a cinnamon mixture is placed on top, then the remaining batter is added. Finally, a very simple chocolate frosting graces the top. Sadly, nothing about this cake is good. I checked it at the minimum time and it was already cooked though the center looked wobbly. Shortly after coming out of the oven the center caved dramatically. Thankfully, the frosting covered this up. Even my teenage boys, however, would not eat this cake. Perhaps it was overcooked - though I don't see how. The cinnamon taste is completely overwhelming. Besides the cinnamon mixture in the middle there is a full tablespoon in the batter for a 9x9 pan. No one finished their piece of cake. We love these and make them often, leaving off the icing. That way you can eat them for breakfast, with coffee, and convince yourself it's breakfast food. They're really quick to put together after dinner, no planning necessary. The taste of this gingerbread was good - but it was really a heck of a lot of work for the outcome. Made with buttercream icing instead of chocolate glaze. Cupcake is very chocolatey, with darker notes, so paired well with the sweet icing. Made for 3rd birthday despite quip in recipe. She loved it. The one time I tried this full recipe, my cupcakes ended up overcooked and sort of dry. I'd start checking 5 min under the baking time if I made them again. The icing is great and easy; it's now my go-to recipe for chocolate icing. This is a rich chocolate cupcake ... definitely for someone who appreciates a strong chocolate flavor. This is a delicious, basic pound cake, the perfect blank canvas to play with. I added a full teaspoon of almond extract to play up that flavor. It worked really well. I did not use an insulated cookie sheet and forgot to double up on the cookie sheets and used the convection bake setting. As a result, the cake overbaked on the outside and dried out a bit. Will try again fixing those problems. This cake was easy to put together but lackluster when served on its own. This cake is delicious, tender, and the marbled effect looks beautiful. This is delicious, and I liked that both white and dark parts of the cake were flavorful. Baked it shorter than stated because of my convection oven, but came out slightly undercooked. It needed 50 instead of 45 minutes. This is a keeper recipe. I added blueberries to the batter and made 12 regular sized muffins (I think they baked around 25-30 minutes but I can't quite remember). They are so delicious, and I'm not even a big fan of lemon in cake. I think they work really well as muffins because the edges of the tops are so crispy - it's like you get more of the best part. I will definitely make these again. Cake doesn't get much easier than this. Baked 2 small 6-inch cakes for about 30 minutes. Not in a lemon mood, I used 1/2 teaspoon almond extract instead of zest, & drizzled top with glaze of a few tablespoons powdered sugar & a little amaretto. This is perfection! Easy and very, very delicious with natural flavors shining through brightly with a pleasing moist texture. Almond, lemon, yogurt, oil, sugar. I didn't even get to glaze the cake before folks were pressing me for a slice while the cake was still warm. Everyone loved it, including me. I will bake this again and again. One sad note: the cake fell in the middle. I need to research why. Nonfat Greek yogurt worked fine. Natural ground almonds created attractive flecks in the cake. I used homemade Meyer lemon-orange marmalade for the glaze. I goofed on the instructions and added the oil with the other wet ingredients instead of at the end, but the cake turned out fine. It was perfectly done after 50 minutes in the oven; it did not rise much, but there was no gummy layer. The texture was soft and moist, and the flavor was pleasantly sweet - perfect with tea. The glaze was attractive, but not necessary from a flavor standpoint. A winner. Dense, mildly sweet pound cake with great taste of lemons and yuzu coming through. Used full fat Greek yogurt, Meyer lemon peels and yuzu marmalade. Dense enough that slicing thinly is possible. Delicious. Good cake, easy to make. Does not need glaze - serve with fresh berries. I doubled the recipe,omitted lemon zest and will make a Boston cream pie cake with it. This cake has great flavour and is not overly sweet but it's surprisingly dry and crumbly considering the amount of butter and cream cheese in it. Delicious! Think about adding fiori di sicilia next time in place of vanilla. This cake didn't have much coffee flavor, but it was very fragrant with cardamom which I enjoyed. Unfortunately, the cake was very dry and that is probably one reason I won't be making this one again. It's been a while since I've made this but I remember we really liked it, and it was a good keeper. This is delicious and easy to make perfectly if you follow the directions exactly. I chose not to add the cooked apple mixture, so I spread a thin layer of apple butter on the crust after it cooled. Then I added the batter, and dropped dollops of the apple butter on the top and swirled them through. This is a delicious cheesecake though quite substantial (as mentioned in Dorie's comment). I would have preferred more apple flavor. Next time I will cut the apples into smaller pieces in order to get them more evenly distributed in the batter or even use apple butter as in the proposed variation. This was a beautiful Easter dessert one year, not as tricky to make as the appearance seems. The crust is fairly thick, almost like shortbread. The dough (crumbs, really) seemed quite dry in the food processor, but was fairly easy to pat into the pan. Seems like it would be challenging to roll. Both the crust and filling were quick and easy to prepare. I used cherry jam, probably double the amount called for, as 1/3 cup wouldn't cover the bottom. I was happy with the larger amount - good ratio of jam to filling. We ate it chilled, since it's basically a cheesecake, but less dense and smooth. It was yummy. Made this several years ago for my brother's birthday. The frosting had a slightly strange gummy, marshmallowy consistency that wasn't my favorite. A real showstopper. I loved the icing the most - marshmallowy clouds. Gorgeous cover recipe, but probably not a repeater for me. Applying crumbs was a real p.i.t.a. . . .
Made this several years ago for a friend's birthday and it was a big hit. I made 12 cupcakes from 1/2 recipe (70 g batter each). They baked in 27 min. I added raisins, pecans, and unsweetened coconut. The cupcakes rose a fair amount but flattened as they cooled. Half the frosting recipe wasn't quite enough to pipe frosting on top. The cupcakes were the "classic" version with all sorts of mix-ins, moist with a coarse, muffin-like texture. We liked them, but thought the frosting was a bit too sweet. I'd add less sugar and more lemon juice next time. Surprisingly good. First made this cake by request & the requests keep coming. Prefer a white sauce-based frosting with cream cheese filling in the middle. Good as cupcakes too. Loved this cake! Nice and moist and all of my changes worked well. Baked in a standard bundt tin at 150C for 65 min. Substituted whole meal flour and spelt flour for the plain flour. Substituted brown sugar for half of the white. No walnuts so substituted half almond meal and half sultanas. Skipped the icing and thought it was sweet enough already. Delicious. Our new go-to carrot cake recipe. We loved the cream cheese frosting, and the suggested addition of craisins to the cake. This is a very impressive cake - incredibly rich. Serve to a chocolate lover and they'll love you for it. One of the best-received desserts I've made. A few notes to remember: when the recipe calls for "oreo cookies" it means the WHOLE cookie, cream filling and all; At the suggestion of a blogger, I upped the crust by 1/4 to 30 cookies and 5 Tbsp butter and I'd definitely do this again. My torte had about 6 hours of chilling and the textures and temperatures were just fine. I've made this for a couple of big parties and have gotten raves! A peanut butter and chocolate lover's dream, it's creamy, crunchy, salty and sweet. It's quite rich, so I serve pretty small portions--Dorie says 6 to 8 servings but I'd easily get 10 or more out of it. Pretty easy to put together though it does need to be made ahead so it can set up. The tip about running a hair dryer over the springform pan to help with releasing it really works--I'd forgot to butter the pan last time and thought for sure it would stick, but it came out cleanly and looked beautiful! This is an impressive dessert! The technique is quite easy even though there are a few steps. You will wow everyone if you serve this! Don't skip the step of refrigerating the mousse overnight. Baked in a 9" Pullman pan, this is impressive. Added espresso powder, 2 teaspoons to the cake, 1/2 teaspoon to the frosting. Also doubled jam filling per previous commenter's advice. With beautiful fresh berries marching around the base, people assumed it was purchased. The super-simple frosting is not sweet, just right made with 70% cacao chocolate. This only really works well if you have a straight sided loaf pan; otherwise, it looks less "dressy." I made the icing with heavy cream as I was out of sour cream and it worked fine. I also used black raspberry jam that was seeded. The raspberry jam was the best part and I would've liked more. Tried this one too for Thanksgiving. Uses tapioca instead of cornstarch as a thickener. I made it as a 9" instead of deep dish and so cut back filling by about 1/4th. It was delicious. I had people asking for 2nds or to take some home. I did cheat and used a store bought crust. It was very messy when it was cut. Looked awful; but tasted great. I think I'll have to try Dorie's crust...maybe it will hold up better. The breadcrumbs and tapioca in the pie definitely helped thicken; but it was still plenty juicy. Made this a few years back but don't remember if it was a particular hit or not. Interesting format, definitely somewhere between a cake and a pie so the title is accurate. This recipe (and really any tarte tatin recipe) is so simple that it comes down to your technique. I failed to use the best pan, choosing cast iron over a clad pan, which meant uneven heating and therefore a few shall we say "dark golden" spots. Moral of the story is that if your burner creates hot spots in the traditional cast iron pan, use something else. Luckily I was able to catch the caramel before it lent a charred flavor to the whole tarte, but next time I'll use my 10" stainless steel clad pan and/or keep the pan on an even lower flame. What a stunning and delicious dish, though! A really good apple custard tart. I used more apples than called for (to fill an 11-in tart pan), but I liked the higher apple to custard ratio, personally. Paired with a walnut crust (from Six Seasons), this was a delightful addition to the holiday table. This pie was almost perfect. I will be making it again, but I will be making it with a thicker pecan pie layer...maybe as much as double the goo and 3 or 4 more ounces of pecans. So glad I finally made this! This is a great pecan pie. Not overly sweet due to the dark chocolate and espresso powder. I used about 25% less corn syrup and I think I would try even less next time as it was sweet enough to my taste. It was a little overbaked (hence no photo) as my oven decided to ignore me when I reduced the temp to 350 for the last 15 mins. I'll definitely make it again. Served it with buttermilk ice cream. Most favorite pie, ever! Prefer pears over apples here. The lemon cream is very good (even from someone who doesn't particularly enjoy lemon desserts). I made this with Meyer lemons which added a nice floral note. The standard crust didn't work that well with the tart. I'd consider either a nut based crust or maybe even a graham cracker crust in the future. Don't substitute salted butter - it ends up way too salty. This tart had way too much butter in it for my taste. The filling tasted like and had the mouth feel of lemon flavored butter. I love butter, but I don't eat it by the stick, so I won't be making this again. Extraordinary is right! Follow the directions exactly and you will have a fabulous dessert. Made this for a BBQ -- not to my taste so I didn't try it but others seemed to like! A delicious take on key lime pie with a traditional condensed milk-lime juice filling topped with fluffy meringue. What sets it apart is a hidden layer of chewy coconut goodness beneath the filling and coconut in the meringue (though I forgot that part!). I froze it overnight; it sliced easily with a warmed knife while still partially frozen. Really simple recipe and incredibly rich! Like the most decadent candy bar. I made this several years ago and still fantasize about it, but I'm a bit afraid to make it again as I may devour the whole thing. Absolutely incredible. Delicious. Was wary of flour thickener, but it worked beautifully. Halved the sugar, & used graham cracker instead of bread crumbs, as in her galette. Really great blueberry pie. The filling had just the right consistency and was just sweet enough. The lemon zest and juice added just enough acid. My dough was a bit too warm when I made this so it didn't hold its shape very well and ended up a bit crumbly. The flavor was very good though! Useful technique tips for preventing soggy crust (jam, crumbs), sizing & shaping, re-chilling. Baked it at 400 though on stone rather than 425, just 45 minutes. Omitted custard. This did not work out well for me. I was unable to get the almond cream to be smooth and satiny. This was great. The almond flavor really complements the pear well. I had no issue with getting the almond cream smooth but I did use ground almonds. Heat the jelly glaze immediately before you are ready to apply it. It will form a skin in just a couple minutes. When berries are all in season this is a lovely way to showcase them in all their fresh tasty beauty. The tart is easy to put together and the end result looks fabulous and tastes delicious. I used homemade raspberry jelly for the glaze and it just intensified the berry flavor. I made this for hubby's birthday - he said it looked like it came from a french pastry shop. used fresh raspberries and blueberries with passion fruit glaze(did not have red currant jelly) - beautiful, crisp crust, not too sweet. This was just amazing! The pastry cream and the crust came together beautifully, and it was so easy to assemble. I used homemade strawberry freezer jam for the glaze, and though it may not have looked quite as nice, it was delicious. I cut large pieces, and people still had seconds. I'm torn about how to rate this. I love the texture of it, and no skin formed on top even though I covered it only loosely with plastic wrap. I love that it combines pudding and custard techniques (cornstarch *and* egg yolks). But the use of the food processor makes the process into too much of a production, too much clean up. Yes, it's fool proof - there's no way you're going to get little bits of cooked egg in this. But all the transferring things back and forth is time consuming and messy. Definitely use very dark chocolate - I used milk chocolate (leftover easter bunny) and it was way too sweet. The kids liked it though. It was quite good. My wife said it was the best chocolate pudding she’s ever had! The flavor of this pudding was fine for us but the texture is not as creamy as other puddings I have made. I agree with twoyolks that it setup very thick very fast. You don't dare stop stirring your pan for even a few seconds with this recipe. I have never used my food processor for a pudding recipe either and the whole process seemed cumbersome. I will stick with the Butterscotch Pudding from "Heartlandia" from here on out. The pudding setup much thicker than I would like for pudding. The flavor of the Scotch was too strong and made it taste boozy. I've only ever had chocolate pots de creme before, and I thought that would be hard to top, but I think I may like this even more. I can't express how amazing these are. I love desserts, but this is a whole 'nother level of bliss. Love making marshmallows, and Dorie's instructions leave no questions about method. This came out too wet and eggy for my taste. Usually Dorie's recipes are great. Not sure what happened here. I halved the sugar in the filling and it was still really sweet, so I can't imagine how sweet it'd be using the full amount. I didn't like the ginger-strawberry combination either. Too sweet. The rhubarb gave off too much liquid, which drowned the topping. Did not care for cinnamon with rhubarb. This is my go-to crisp topping that's not only perfect with the fall fruits in this recipe but with summer fruit as well. It's crisp, chewy and very flavourful and like anya_sf, I think needs no further embellishment. I made 1/2 recipe in one large dish; baking time was the same. There was plenty of topping relative to fruit. I loved the coconut in the topping - unlike most crisps, which IMO absolutely require ice cream, this one was flavorful and sweet enough on its own. My family thought it was delicious. This was very good, but mine didn't come together at all with the amounts in the recipe (it was just a bunch of crumbs that wouldn't hold. I had to add more cream to get the mounds of dough to stick. I tried this with white lily flour and don't know if that caused problem. I made 12 and definitely used more than 1/3 cup for each shortcake. This recipe contributes to my idea of strawberry shortcake perfection. Crunchy and a bit crumbly on the outside, buttery and tender and a bit sweet on the inside. So simple, too. The yield is closer to 13 or 14 rather than 10, which means you can take Dorie's advice and freeze several unbaked dough balls for later! We loved this no-egg ice cream -never thought blueberry ice cream could be so out-of-this-world! I have also tried this with some variations: 1cup of fresh crushed strawberries, uncooked just macerated with one quarter cup of honey and one quarter cup of sugar, one tsp of lemon rind and juice, and one half cup of yoghurt with a full cup of heavy cream. Strawberries and cream ice cream! Super easy and no custard required. Tastes like blueberries and sour cream. Even made with imported blueberries, which are not always great to eat fresh, the taste was great. I thought the texture was fine, but it wasn't perfectly smooth and definitely formed an icy layer around the edges of my inexpensive canister-type ice cream maker. Still, we loved the flavor and simplicity of this recipe. I think this must be about the perfect pie dough recipe. I tried it for the first time yesterday for my Thanksgiving pumpkin pie. Except for substituting 1Tbls vodka for 1Tbls water (per the Cooks Illustrated method) I followed the recipe exactly. I had a bit of extra dough which I rolled out, pricked with a fork, lightly buttered and sprinkled with cinnamon and sugar then baked in another pan. My family calls this "treat" and my husband went crazy over this one. Even though we won't eat the pie until later today I know from the sample we had yesterday that the crust will be perfect! This is a great short crust. It tastes like a shortbread cookie and is very easy to work with. I made an 8" tart and filled it with pastry cream, roasted rhubarb (from a recipe in Nigella's 'Domestic Goddess'), and poached strawberries. I then boiled the strawberry liquid with some slices of ginger until it was thick and finished the tart with that. Very good. Find that even if I freeze as instructed before baking, it will shrink unless I pile the weights (beans) high around the sides. This pastry cream ended up more like fudge than what I would consider a pastry cream. I ended up whipping 1/2 cup of cream and folding it in to lighten the texture. The flavor was rich and decadent, and not very sweet (I used 70% dark chocolate). I think next time I would reduce the cornstarch to 2 Tbsp. instead of 3. Not a big fan. It puffs up a lot but the inside remained wet. Good flavour though I'll look for a different recipe next time. Everybody should make this! The lemon cream was so delicious, I predict that I will rarely stray from using this recipe when making tart filling in the future. I made mini tarts using Pierre Herme’s sweet tart dough recipe and filled them with the lemon cream the following day. There is a process with this recipe but it works like a dream so it is well worth following. You need a strainer, thermometer and blender / food processor but you could probably still get a decent result without all this equipment as the intent of the instructions is quite clear. Absolute winner. Substituted golden syrup for corn syrup. Made double so that I could use half when friends were over and keep a stash in the fridge for myself. Filled with lavish photos, and a wealth of recipes from cakes to cookies to breads, it's the one-and-done baking book any baking aficionado needs on their shelf. It contains not only her favorite recipes but also an ample serving of the knowledge she has acquired over the past 30 years, during which she has baked nearly every day. Listen to Dorie talking to NPR about baking and the online community, Tuesdays with Dorie, that she inspired. Good brownie recipes abound, and all you have to do is follow them. For a soft, light, buttery brownie, I like Dorie Greenspan’s French Chocolate Brownie. They came out tiny — about an inch long — and crisp and brown, with a flaky crust. The tidiness of rolling the rugelach into crescents was offset by the filling that seeped out in rustic smudges. Light and creamy and delicious, and the graham cracker crust was nicely salty. It was tangy but not too too tangy. In all it tasted just like you imagine a good bite of cheesecake will taste like. These brownies are just about beyond description, but here’s my best shot: thick and fudgy, dense in flavor and texture but soft and free of heft — these are extraordinary brownies. ...they did make for a sweet, unbelievably light cake — unbelievable given the size and presence of the thing, which was formidable. The finished product was “gorgeous”...It tasted about the same as last time — maybe a little lighter, a little airier — but it looked right. I took its picture with the joy of a proud parent. The dough is a real pleasure to work with and the final cookie is nutty, spicy, buttery - pretty much everything that you could ask for in a cookie... raspberry jam really pushes it over the top. These cookie bars are serious business. They’re crunchy, chewy, chocolaty, nutty, and delicious. Cutting these into small pieces is a good idea...but I think they’re actually better than a candy bar. This consists of an Oreo crust filled with a light, rich peanut butter mousse, topped with chocolate ganache and chopped roasted peanuts – it’s every bit as delicious as it sounds! this cake wasn't too fussy - well relatively, we are talking about a layer cake here...Layers of raspberry preserves and lemon buttercream decorated simply with a little coconut. While they make good chocolate cookies I really couldn’t taste the pepper much (and I put in what was called for). If this cake was any fuller of apples and nuts there would not be any room in the pan for it all. And it is so moist!! This is definitely one to keep handy. It is, as Dorie put it, rough and rustic. ...and it never fails me. And Dorie is NOT a southern girl. Stylish! Sophisticated! Well-Traveled! Great cook/baker! BUT NOT SOUTHERN!!!!! She should NOT be able to make biscuits THIS good!!! Dorie knows what she is doing when she listed these delightful treats under the Breakfast Section. What a great way to start the day – Chocolate!!! And with a glass of milk– perfect!! There is nothing better first thing in the morning than a cuppa tea and a fresh baked scone. IMO!! And if the scone is Dorie’s it’s extra better. ...there are certain occasions in life that deserve indulgent baked goods, unadulterated by whole grain flours and blessed with the amount of butter that god (or Dorie Greenspan) intended. The cake is sweet but not too sweet so it is a perfect foil for a sweet fruit coulis or a simple syrup or ice cream. Even adding a flavor like almond or citrus...And, it is so easy to put together. The flavor of this sorbet is very intense. The chocolate is deep, dark, and creamy....This one will be hard to keep in the freezer very long! These were crunchy on the outside – hold one hand under your chin as you bite down crunchy – and chewy, chocolately on the inside. A perfect combo. I could really taste the ginger, but couldn’t really taste the cinnamon. But they were still GO-OD!! This bread is so rich (three sticks of butter!!) it doesn’t need any accompaniment of butter or jam. Warm from the oven or toasted, it is as good as it comes. The streusel is put on before the crumble is baked so it melts into the mangos and bananas for a rich tasty treat. ...if you like cornbread and you like apples then this loaf is just right for you. It contains both fresh and dried apples spiced up with cinnamon (optional. NO!!) and nutmeg. I was curious to see how the cloves would affect the chocolate flavor. I was soooo disappointed. I could not taste the cloves at all and I had even added a tad extra. ...chocolatey, delicious fudgey treats. They may be small in stature but they are big in taste. Chocked full of chocolate - bittersweet and unsweetened - and walnuts they are sweet and crunchy. ...taste wise, it doesn’t need a thing. The fruit makes it feel virtuous but underneath those pear halves, it’s still all cake (moist, slightly nutmeg-y cake). Molly thinks this is the best shortcake she has ever had. Dorie Greenspan has written recipes for the most eminent chefs in the world: Pierre Hermé, Daniel Boulud, and arguably the greatest of them all, Julia Child, who once told Dorie, "You write recipes just the way I do". Her recipe writing has won widespread praise for its literate curiosity and patient but exuberant style. (One hard-boiled critic called it a joy forever.) 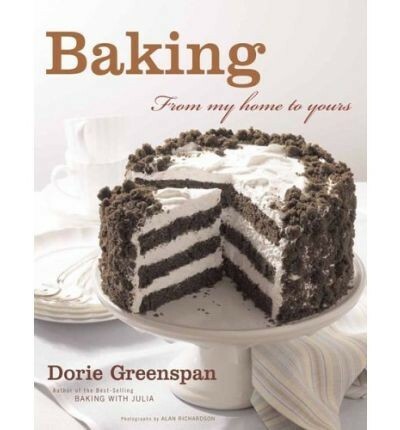 In Baking: From My Home to Yours, her masterwork, Dorie applies the lessons from three decades of experience to her first and real love: home baking. The 300 recipes will seduce a new generation of bakers, whether their favorite kitchen tools are a bowl and a whisk or a stand mixer and a baker's torch. Even the most homey of the recipes are very special. Dorie's favorite raisin swirl bread. Big spicy muffins from her stint as a baker in a famous New York City restaurant. French chocolate brownies (a Parisian pastry chef begged for the recipe). A dramatic black and white cake for a wow occasion. Pierre Hermés extraordinary lemon tart. The generous helpings of background information, abundant stories, and hundreds of professional hints set Baking apart as a one-of-a-kind cookbook. And as if all of this weren't more than enough, Dorie has appended a fascinating mini book, A Dessert Maker's Glossary, with more than 100 entries, from why using one's fingers is often best, to how to buy the finest butter, to how the bundt pan got its name. Dorie Greenspan has written or cowritten eight cookbooks, including Baking with Julia, which won a James Beard Award and an IACP Award; Desserts by Pierre Hermé, which was named IACP Cookbook of the Year; and Chocolate Desserts by Pierre Hermé, which won the Gourmand World Cookbook Award for the best English-language cookbook. She created many recipes for The All-New Joy of Cooking and is a special correspondent for Bon Appétit, for which she writes the Tools of the Trade column.